BestCities Global Forum in Tokyo helps associations build “Global Connections Across Cultures”, receives exceeded their expectations from 95% of delegates. 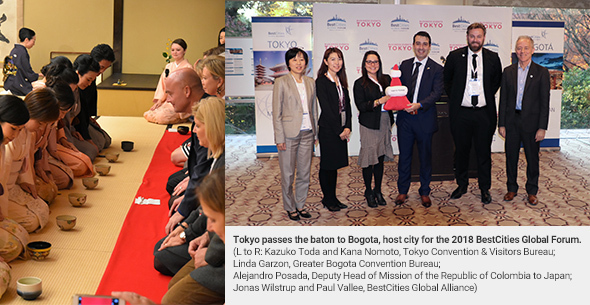 Tokyo Convention & Visitors Bureau (TCVB) successfully hosted the four-day BestCities Global Forum in Tokyo last December. A staggering 95% of delegates reported that the Forum met or exceeded their expectations, while one hundred percent of delegates surveyed agreed that they would recommend attending BestCities’ 2018 event to other international association delegates. Jointly hosted by the BestCities Global Alliance and its partner TCVB, the theme of the Forum was “Building Global Connections Across Cultures”. Led by a range of internationally respected consultants and industry leaders, the packed program combined engaging educational lectures with lively interactive workshops. Visiting delegates were hosted at the luxury Hotel Chinzanso Tokyo, where they enjoyed the very best of Japanese efficient service and warm hospitality, including the opportunity to participate in a full cultural program designed to immerse them in Japanese heritage and traditions. Delegates also learned about the exciting legacy opportunities for the meeting industry presented by the Tokyo 2020 Olympic and Paralympic Games. BestCities Global Forum 2018 will take place in Bogotá, Columbia in December, with the theme “Power of People”. It is open to senior executives of associations (or AMCs representing associations) that are considering hosting international business events whose location will rotate among the 12 BestCities Global Alliance partner cities: Berlin, Bogotá, Cape Town, Copenhagen, Dubai, Edinburgh, Houston, Madrid, Melbourne, Singapore, Tokyo and Vancouver. Established by Roppongi-based companies, organizations and other groups, Destination Marketing Organization (DMO) Roppongi helps planners across the globe hold effective business events in the Roppongi area by providing services such as introducing unique events venues, booking accommodations, designing and creating tote bags and novelty goods, organizing venue transfers and tours on request, among many others. Roppongi is home to two of Japan's most famous complex buildings: Roppongi Hills and Tokyo Midtown. Both of these complexes offer high-grade accommodations for conventions and other gatherings. In addition to these major centers, the numerous luxury hotels, including The Ritz-Carlton, Tokyo and Grand Hyatt Tokyo, also contribute to Roppongi’s status as a cutting-edge community. Unique venues like the Roppongi Hills Arena and the Mohri Garden, museums, parks, observation decks, traditional Japanese shopping streets, numerous restaurants to satisfy any taste, and other attractive sites make this area for a perfect choice for any business event. Last November, the Roppongi area was host to the Congress of International Federation of Reproduction Rights Organization (IFRRO). DMO Roppongi lent its support to the host organization, the Japan Academic Association for Copyright Clearance (JAC). DMO Roppongi helped JAC welcome 190 guests from 57 countries and assisted the Congress by helping select the meeting and banquet venues, booking accommodations across several hotels, and organizing Japan cultural entertainment events such as ninja and Japanese classical dance performances. In addition, DMO created novelty goods for the Congress, organized ten different tours and trips, and provided participants with maps of the Roppongi area. Congress organizers and all participants were highly appreciative of the efforts of DMO Roppongi, stating that the organization had helped make the Congress a success. DMO Roppongi spares no effort to produce unforgettable Tokyo business events. Beyond organizing traditional experiences such as Japanese sweets and sake tasting, ceremonies held in shrines, and so on, it plans and organizes technical tours in various fields including architecture, art, disaster prevention and more, making it a one-stop resource for any information and consultation its customers might need. For more information, please see:http://www.dmo-roppongi.jp/en/about/ or contact info@dmo-roppongi.jp. The Shinagawa Prince Hotel, located in front of Shinagawa Station (just 14 minutes from Haneda Airport), has announced the opening of DINING & BAR TABLE 9 TOKYO. This new locale will be the hottest nightlife spot in Shinagawa, featuring a 360° panoramic view of Tokyo. TABLE 9 TOKYO will present many exciting news way to savor the city at night - from a lounge where guests can sip Japanese sake while gazing out at Mount Fuji, to a grill and steakhouse serving genuine Hida Beef, to a bar with a DJ booth looking out on Tokyo Tower, and more. TABLE 9 TOKYO features nine areas, including creative cuisine dining, grill dining and two lounge areas as well as three bars: WHISKEY BAR, COCKTAIL BAR, and DJ bar NINE. This nearly 2,000 square meters space is located on the hotel’s top 39th floor, approximately 140m above ground, and can accommodate 495 guests in total. Comprised of a large pond and manmade hills with valuable rocks collected from all across Japan, Kiyosumi Gardens is a superb example of a strolling garden from the Meiji Period (1868-1912). Request a splendid meal reception at the Taisho Kinenkan Hall (475 square meters in area), which provides a magnificent view overlooking the garden. The hall can host 90 people for seated dining or 130 people standing, with welcome drinks served in the exquisite front garden. Ryotei Lodge (40 square meters), is a building that serves as the centerpiece of the garden. It can accommodate up to 30 people seated, and has been built so that it overhangs over the pond. During a workshop organized by TCVB in January as a part of a Tokyo FAM-trip program at Ryotei Lodge, participants exclaimed in delight at the sensation of feeling like they were floating on the pond surrounded by the breathtaking garden. Some examples of events that can be held in this unique venue include Japanese cultural experiences like Zen meditation and yoga to relax the body and increase mindfulness. The efficacy of such activities greatly benefit from this quiet yet stunning location, which lies hidden in the center of a bustling metropolis. For more information on unique venues, please see: http://businesseventstokyo.org/venues/unique-venues/ or contact TCVB. The Hyatt Centric Ginza Tokyo just opened this January on the fashionable Namiki-dori street that runs parallel to the main Chuo-dori boulevard in cosmopolitan Ginza. The hotel occupies a 12-story building on the former site of the first Tokyo office of one of Japan’s major newspaper publishing companies. Guests here, at the first Hyatt Centric hotel in the Asia-Pacific region, can relax and recharge in one of the hotel’s 164 contemporary guestrooms and suites designed to reflect the neighborhood’s characteristic blend of tradition and innovation. The Namiki Suite, situated on the top floor, has a spacious terrace overlooking Namiki-dori and is equipped with a full-sized teppanyaki grill, making the room ideal for dinner parties. Its roomy 127 square meter floor plan is also well suited for use as an event space. The suites are each 77 square meters in size. Deluxe rooms offer 47 square meters, while standard guestrooms are 35 square meters. The hotel features a gym and a private dining room in the restaurant that is available for small gatherings, seating up to 24 people. The hotel’s signature dining and bar area, NAMIKI667, has tables on a 100-square-meter terrace overlooking the street, and is sure to become one of the capital’s most highly sought reservations. Happo-en, a uniquely picturesque venue of traditionally styled buildings built in a Japanese garden which dates back nearly 400 years, announced that its on-premises restaurant, Kochu-an, has started serving a Muslim-friendly full course meal featuring Halal Wagyu beef. Only Halal certified ingredients are used in order to guarantee that Muslim guests can rest assured while enjoying their meal. The authentic Halal Wagyu is served in a private tatami-matted dining room with a gorgeous view of the Japanese garden. The vegan menu served at Thrush Cafe here can be also cooked Halal upon request. For a Tokyo Muslim Travelers’ Guide featuring meals, places of worship, hotel catering, shops and more, please click here. Free Wi-Fi on all Limousine Buses; Toei Subway to follow suit by 2020. Airport Transport Service Company Limited, known as 'Airport Limousine Bus', one of the world's biggest airport bus companies, announced that free Wi-Fi can be used on all buses chartered to and from Narita Airport and Haneda Airport. Free Wi-Fi will be available in all Tokyo Metro and Toei Subway stations by 2020. The Michelin Guide has announced its Tokyo star rankings for 2018. The Japanese capital continues to outshine any other city on the planet, as the number of restaurants there that have been awarded stars climbed to 234 in all, up from 227 last year. All of the three-starred restaurants (12 in total) maintained their distinctions. Five new restaurants were added to the list of two-starred establishments (56 in total). These include Den, which offers innovative cuisine; Florilège, where the chef serves French cuisine presented using Japanese plates and bowls; Higuchi, where the chef/owner tweaks Kyo-ryori to suit Kanto tastes; Hommage, where chef-owner Noboru Arai prepares ingredients from all over the world using French techniques; and Sazenka, a restaurant offering Chinese cuisine. Twenty-three new restaurants appeared in the guide at the one-star level, bringing that total to 166.